Recently, I've been having porridge for breakfast most mornings. I find porridge on its own quite boring and it doesn't inspire me to get out of bed and start the day. I like to mix it up now and again with some cinnamon sugar, raisins or golden syrup etc but then I found chocolate porridge. 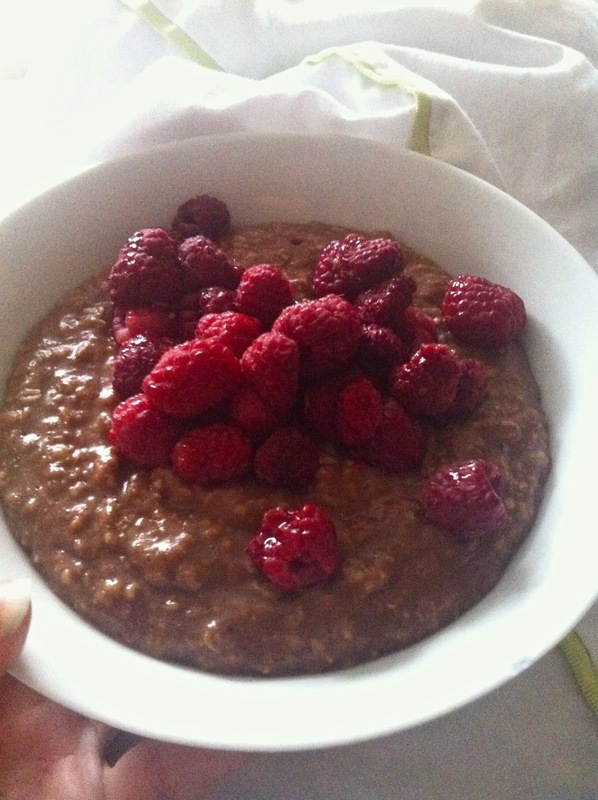 I was a huge fan of chocolate Ready Brek when I was little and this recipe bought back all sorts of memories. It couldn't be more simple to make, which is perfect for me as I'm as far from a morning person as you can get. All you need to do is make your porridge as normal on the stove. I use 1/2 cup of oats to 1 cup of milk, best to look on your pack of oats as no one wants overly sloppy porridge. Once that's looking like it's almost ready, it's time to make the chocolate mix. In a cup I add a heaped teaspoon of cocoa powder, a teaspoon of sugar and then enough milk to make it a nice chocolatey liquid. Pour this into your porridge, give it a good stir and ta-da! You now have chocolate porridge. I added some raspberries to the top of mine but it's just as good without. Let me know if you try it out!